Welcome - Thanks for visiting our Country Coach Allure Network page. 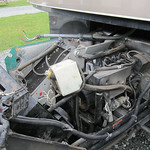 Since August of 2007 we've been learning about our 2006 40' Allure 430 (# 31349 w/Cummins ISL 400) which has presented some interesting challenges for us. Education is an ongoing process and reading internet content has been a valuable resource for learning about maintenance, repairs and improvements. I'd like to put back some easy to access information to help others. Organized here are the projects we've undertaken to stay ahead of the many maintenance and repair items. Also included are improvements that have helped us with comfort, health, safety and efficiency. 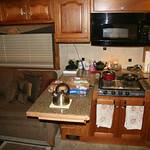 The goal of this page is to provide helpful information to other motor coach owners and also provide a venue for you to share your knowledge and experience through our BLOG. I'd like to invite you to join, discuss, contribute and participate in your spare time. Your knowledge and experience can help others. Using this small and intimate blog, motor coach owners like yourself can get/give focused information in the spirit of give and take. I sincerely hope you find the information contained herein helpful. Feel free to contact me (email address is at bottom) with your comments and suggestions. If you need any assistance registering on the BLOG I'd be happy to help. Please report any problems you are having accessing this page. The blog format is accessible to anyone that can bring up a browser session. It allows interacting with others in real time. Photos can be imbedded within content to improve the communication of details. Content can be searched to locate specifics or indexed as presented in the tables below. The blog (and all its data) resides on my server space and is secure. There are no worries about your data being sold and/or email addresses being hacked or hijacked. It's one of the easiest and safest ways to share information between interested parties. The blog software also provides many unique features to help organize and present your data. Below are two tables that organize projects into a Maintenance/Repairs category followed by Improvements/Upgrades. Slide shows are available for each project which include helpful captions. In many cases companion articles can be read by following the BLOG ARTICLE link. Articles go into greater levels of detail and, via the blog, provide a means for discussion, comments and questions. We have a Cummins-Onan 8K generator in our vehicle. It isn't something we use often but when you need to use it you'd like it to start and run properly. I exercise the generator about every 1-2 months. Last time the test run went fine. Several weeks later the power went out and I tried to use the generator. It started but stopped after about 10 seconds on a fault code 27. Lost PMA sense. 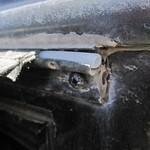 Read about how I got this repaired. 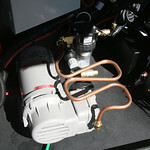 The Thomas leveling compressor uses a plastic feed line. This can develop a blow hole leak. The Thomas compressor used a plastic tube for the air line. This melted when the air got hot and developed a blow hole right at the cylinder head. Something you might want to inspect to avoid not being able to level your bus. Coolant return hose leaks. Avoid a gusher by replacing them now. 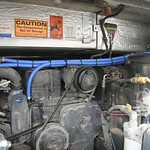 OEM coolant return hoses are Gates fuel line. I found check cracks in the rubber which was a surprise. I upgraded to silicone hose which is a better choice. Read to find out what's involved. Slide trim paint jumping off. What gives here? This is an advanced DIY project but it can be done. I document my steps, thoughts, tips and suggestions. Perhaps this will help you do a better job and avoid some of the common mistakes. Maybe one less trip to the body shop makes it all worth while. Power Gear Slide Motor Inspection. The D/S main slide works in a unique way. 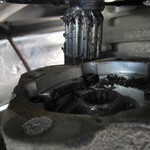 HUGE amounts of torque can break gears and strip bolts. 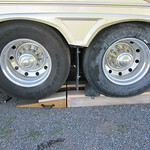 It's a good idea to check out this mechanism to avoid the big extension that keeps you from traveling. I needed to tighten loose bolts and I also found a fuel leak. It was a fun time replacing the oven interior bulb. 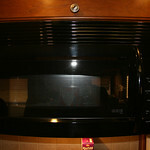 Also GE creates an oven that can't really be cleaned. Check out my story. Underneath your entry step door is a channel that holds water. Over time this will develop rust and if allowed to progress will be harder to fix. Act on it early to save time and money. Radiator Replacement. 9 days in south Phoenix behind barbed wire. It all started at 18K miles with a faint smell of anti-freeze before the drips started. 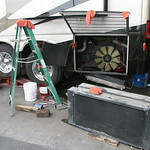 Soon it blossomed into a full blown radiator replacement at around $6,000.00 to fix the leak. Our anti-freeze puddle came in a Texas rest stop in the middle of nowhere. Slide show includes captions and useful information. 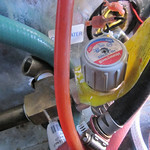 Installing the Cooper Standard stir pump in the Hydro-Hot unit. My Hydro-Hot model is HHE-200-09E with a GRI stir pump. 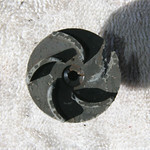 The plastic impeller in the stir pump just crumbled. 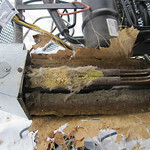 Loss of continuous hot water is the result. Not a bad fix. Webasto turbine motors last only so long. Mine wore out its brushes. The Webasto turbine motor can't be serviced as it's a sealed unit. Too bad since $5 worth of brushes would avoid buying a new motor at $500.00. You'll want to replace the coupling as well. 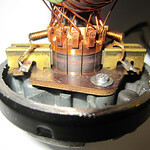 Your Honeywell anti-scald valve installed in the Hydro-Hot system will need replacement in 3-5 years. 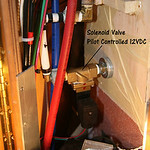 Honeywell's anti-scald valve control knob will seize up. That means it's shot. This is a delicate repair and if you break off the copper tubing that leads to the heat exchanger it will add thousands of dollars to the repair bill. Tread lightly with this one. 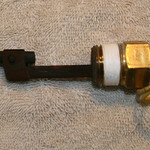 Hydro-Hot tank level switch replacement. At $150 you'd think they'd last longer. And when they fail, your Hydro-Hot basically shuts down. I'm on my third switch. You can jump out this switch but that isn't recommended as it compromises safety. 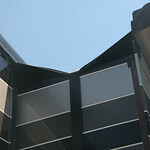 Awning toppers leak at the channel which does damage. 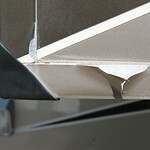 I replaced my awning toppers with good quality SeaMark material. Still had an interesting leak in the track to run down. Burned wires and parts in front A/C unit is scary. It's a good thing the electrical parts in the A/C units are inside a metal box. 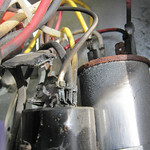 Burned wires, capacitors and starter module could have been a fire. I revamped my A/C unit's electricals with new stuff. You'll need to go up on the roof to do this. Someone at the factory couldn't bother to give this fitting an extra turn. Engine coolant began to drip. A small engine coolant leak was traced to a fitting that wasn't tightened properly. Not serious but I didn't know if it was a gusher waiting to happen. 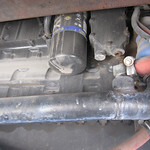 Made repairs to include a new silicone hose which isn't a bad idea given the temperatures inside the engine compartment. A dangerous situation with Norcold's 1200 LRIM. We were lucky to avoid burning our bus down, however. Is your neighbor informed? Norcold was too cheap to make a quality cooling unit which left many with a severe fire damage. 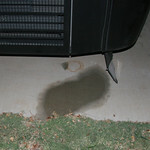 Our Norcold 1200 LRIM cooling unit crapped out. 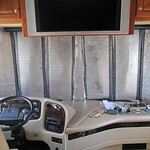 Pines RV Refrigeration makes a quality replacement which we installed. A 15 hour repair project for us but we got through it somehow. If your entry steps don't retract you can't travel. This happened to us. Our entry step problems were traced to a broken wire in the cable harness. Two broken wires were found. 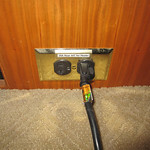 One inside the cable within the door jam and another at the terminal block inside the door. Usually there is enough slack in the cable to pull in new wires. Make sure to not mix up the wiring when you redo the connections. Slide Leaks Part I. Stemming the flow of water to avoid damage. If you have slides they are going to leak. It isn't a matter of if but when and how much. 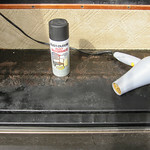 Part I deals with awnings, fabric, track and slide top. Slide Leaks Part II. Stemming the flow of water to avoid even more damage. I missed discovering that multiple joints were leaking in my slides. The water proceeded to damage floors, rugs and veneer to name a few things. Using tape you can avoid hassles, expensive repairs and electrical problems. PTO splines can fail. Ours looked good after 32K miles. The Sauer-Danfoss hydraulic pump can take 12 weeks to procure. And that's your only option if the male spline grinds down. It's a good idea to inspect the spline and repack with synthetic grease. Removing the pump to inspect/repack isn't hard. Some install a "wet" kit but we didn't go this route. Our bathroom mirror proceeds to fall off. 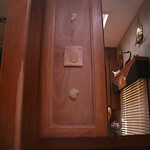 We have 4 door mounted mirrors which are found on the bathroom cabinets above the sinks. Each mirror is fastened to the door face using a mastic which isn't visible. That is until one falls off. That's exactly what happened back in June of 2009 when Jeannie innocently pulled on the handle to open the cabinet. 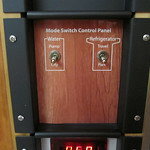 You can run your refrigerator from the inverter. Some modifications may be required. One suggestion on how to wire your refrigerator to the inverter. This works well for traveling to avoid using the generator or propane. We didn't have an extra breaker on our sub-panel. Some extra wiring and a relay got around this situation. 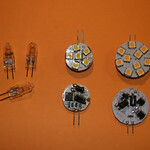 LEDs have come a long way. Super bright ones make for good light. We've cycled through 2 versions of LED replacements for incandescent G-4 lamps. The lastest ones that produce warm white light are pretty good. They offer a viable alternative to standard G-4 bulbs at lower power, cooler temperatures and slightly more light. 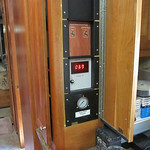 Installing an inside reading water pressure gauge. I had a scare with a faulty regulator that could have resulted in a plumbing leak. No one wants a gusher inside their vehicle. 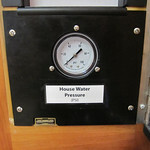 If you are using cheap regulators, keeping track of water pressure is really important. Your plumbing system is only rated for 45 PSI. Installing a flow control valve in the shower. I think it is a good idea to conserve fresh water. Especially if you are stretching your fresh water tank supply. The goal is to use innovation to improve functionality without sacrificing performance and/or enjoyment. Presented here is an idea that some may find interesting and useful for saving water during a shower. 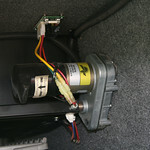 Getting more out of your water pump on/off button. Hoses, pipes, fittings, faucets and tubing can let go any time. 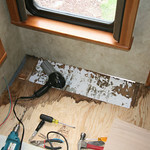 Interior water leaks can do thousands of dollars of damage. Peace of mind comes from shutting off the water at its source. Here's how to install a remote control shut off valve. Adding some additional counter space. It's helpful for some cooking activities. When you use your stove, the two inset panels get put aside. Why not use them to recover the space lost to the stove top. A simple frame allows this to be done. Dust is a real hassle. Plus it's not healthy to breath. 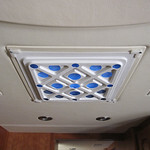 A filter can help reduce dust. No one wants a dusty living space. Dust traps moisture which can cause mold. It isn't good to breath either. Using a filter and positive pressure, dust can be significantly reduced. Solar power. What you'll pay for free energy. In remote areas it may make sense. To the best of my knowledge our solar system is the biggest you'll find on any bus. It's an expensive undertaking with a long pay back period. 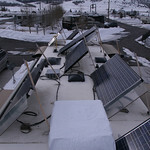 That said, it may be the only available power in remote areas. 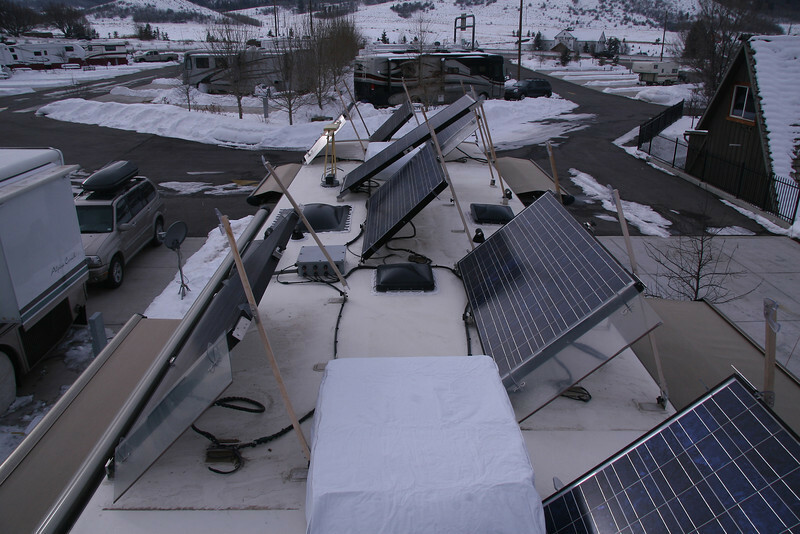 Cutting down generator time can save money. Read this three part article and draw your own conclusions. All fixes and upgrade projects are offered on an "as is" basis so proceed at your own risk. Make sure you check the information and details to ensure it's appropriate for your specific situation before proceeding. Seek professional help if you're not comfortable doing the work yourself. Some of the projects are difficult and require experience to complete them safely and properly. Insurance implications may exist, so know before you go.